Features: High Quality, Good Finishing, Light Weight, Corrosion Resistance, Durable and Sturdy. Using fine quality raw material and up to date techniques in our state-of -the art manufacturing facility, we offer best quality Aluminum Thali. Our Company provides high quality aluminium thali to our valuable customers. We bring forth for our patrons by manufacturing and supplying a quality range ofAluminum Musalmani Kuncha. Having a pre-determined quality administration system, we are thoroughly betrothed in delivering Aluminum Bombay Plate. 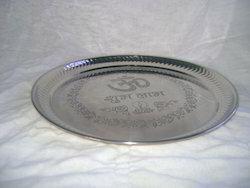 We are known as a renowned manufacturer , supplier of aluminium thali. These thali can be used for multipurpose usage. Diameter : 16" - 17"
Circle : 20" - 22"
We are one of the best supplier of aluminium thali. - Computer Code No. MK01 to MK03. - Aluminum Plate in frosted finish with beaded and punched edges. - Thickness of Sheet : 1 to 2 mm. - Available in diameters from 10.5 ins. to 33.6 ins. 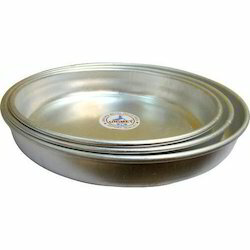 We have founded ourselves as a recognized manufacturer of Aluminium Thali.